You’re on your own for the corned beef and the herring. But if it’s a Jewish deli-style Kosher dill pickle recipe you seek, you have found it. These have the taste of the classic barrel-aged dill pickle of a Jewish deli, bursting with a nice boost of salt and a naturally-created tanginess. Cucumbers are the classic, but by all means, try this with green, unripened tomatoes or Brussels sprouts. And feel free to add additional flavorings such as celery seed, ajwain seed, cumin seed, dill seed, juniper, or whole mustard seeds. First, prepare the cucumbers. Scrub them really well, particularly the root ends, as these can leave your pickles soggy. 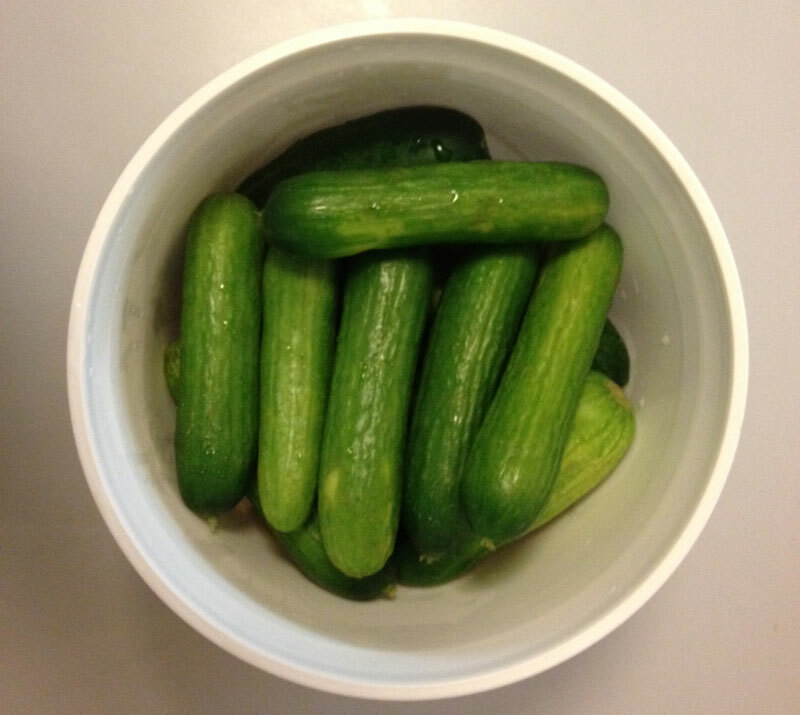 Place the garlic, pepper, and dill in the bottom of a large glass jar or crock, and stack in the cucumbers. Pack them in as tightly as you can without bruising. Meanwhile, in a separate pitcher, combine the salt with 1 quart of water until it makes a cloudy brine. Pour the brine over the cucumbers until they are completely covered in liquid (even if it means mixing up a second batch of brine). The vegetables will want to float: dissuade them from doing so by adding weight (such as a bag full of water over a drop lid) at the top of the jar to fully submerge them. Cover loosely with a kitchen towel to let air in and keep debris out. Let the jar or crock sit in a cool, dark place. After a few days, you will start to notice some small natural fermentation bubbles and a “pickled” aroma; this is good. You may also see mold spores or slime on top; remove them and discard, and keep checking for their reappearance very few days. Taste after 7-14 days (vegetables will ferment faster in warmer weather, and larger vegetable take longer to ferment). Feel free to let your pickles go longer if you’d like them to get more sour and tender (however, note that they will also continue to sour, albeit more slowly, in the fridge). Many people let them go for months for a really tangy taste. When they are ready to eat, either cover tightly or transfer to jars with lids and refrigerate. Be sure to evenly distribute the liquid with the solids (and if you need more liquid, mix up another batch of brine). These will keep refrigerated for several months. However, note that the flavor and the texture will continue to evolve, and that your pickles will be at their best after being refrigerated for about a week. Time: About 1-3 weeks These pickles should not be canned. Hi there. This is my first experiment with fermented pickles, and I’m worried about the mold situation. A few of the cucumber stems keep poking up to surface level and that’s where most of the mold seems to be developing, then creeping down into the pickles and brine. Is the whole thing ruined? I scrubbed the cukes like you said, but they were beautifully clean to begin with, so not sure what I could have done differently. I’ve scraped as much of the mold off as possible every day or two, but it just keeps coming back. I’m all for experiments but I’m not sure I’ll be able to stomach eating these. Any suggestions? Thanks! Hi, you might want to google fermented pickles. I think this stuff that forms at the top is supposed to be skimmed off? Yup, as I say, the scum from the top should be removed. I have never left a comment on a recipe before but wanted to thank you for this recipe. My pickles are delicious and were so easy to make. The only thing different I did to your recipe was to add a bay leaf I picked (so it wasn’t completely dried). No scum, just a couple of floating white mold which I scooped out. I was afraid to try them but they smelled good and were crisp? How does that happen?? I just put my crock in the refrigerator and can’t wait to try them as they age. Molly, you should have put a plate (just a little smaller than the diameter of your crock) on top of the cucumbers and then weighted that down with jars (or ziplock bags) filled with water. No cucumber stems should be poking up above the brine line. If you use one of those “Pickler” screw top lids you will not have to worry about the scum. These allow you to make fermented pickles without all the bother by allowing the gasses out but no air in. Great invention! Just do a search for it. Yes, that’s right. This is a fermented pickle – a totally different animal than a vinegar pickle. Thanks, I started a batch yesterday. I can’t wait to taste them. Should the brine turn to a light brown color? Ours did and I am just wondering if that is ok.
Hi Donna – if there are peppercorns in there, that could account for the discoloration. IF that’s the case then this is just part of the process. Is there a way to make it shelf stabe after fermenting ? Hi Erick! Unfortunately, not really. Fermented foods are living foods, and the process of canning for shelf stability requires a sterile environment. (Think about the taste of canned saurkraut vs. fresh.) Fermented foods can keep in the fridge for months, however. Just keep the pickles submerged in the brine and they will last for ages at the back of the fridge. Happy pickling! It’s a little warm this summer. and hard to find a cool place for the fermenting. Can I ferment the pickles in the fridge from the start? It’s going to be really difficult to get a fermentation going in the fridge, as it’s too cold (usually between 32 and 40 degrees F.) Fermentations like 55-75 degrees F ideally. if the ambient temperature is really hot you could put a small amount of ice packs in a cooler with your pickles to get it going for the first few days, but usually cool room temperature is sufficient. Thanks for the recipe! Quick question, if I don’t have a large jar or crock, could you use a stainless steel pot? Also, would letting them ferment in qt jars from the beginning change the recipe or flavor? Thanks again! Hi Joe! Wine and beer are often fermented in stainless steel. It is possible, but the limitation is that it’s difficult to see what’s going on inside the vessel – it’s always reassuring to look in and see those little bubbles a’brewing. Going with quart jars is possible as well, but just make sure the proportions of ingredients and salt water are evenly distributed. Happy pickling! This may have been the easiest food I’ve made since I learned how to toast bread. I’ve spent my entire adult life looking for the tastiest dill pickles and now I have an entire crock of them in the fridge. I was worried because its really hot here in Seattle and I have no AC (do not get me started on the stupidity of buying a home with no AC). I put the crock on a bookcase away from sunlight and despite 80F+ temps indoors the pickles turned out perfect. I think they were done faster than normal (5 days) but I kept my eye on them and had no problems with mold or spoilage. Using a small plate weighted with a jam jar kept them nicely submerged. Excellent super simple recipe! HOORAY! I am so glad you like them! Thank you for your kind words. This sounds like a great recipe! It looks so easy to follow and simple. Been wanting to try making my own pickles at home for ages now, and I think your recipe just sent me over the edge. Its definitely happening! Thank you for sharing! We have a batch of large cukes from our garden. Can we slice them into spears before fermenting? I learned from my Hungarian mom a very similar recipe, difference being a slice of white bread which is placed on top, then covered with a plate and left in a warm spot to ferment. We cut the pickles in quarters leaving the ends intact, it speeds up the process. I also do cabbage the same way but without garlic. So very tasty!